The band tee is the quintessential casual-cool T-shirt. They can be worn with anything and look effortless. A lot of stores are selling band tees right now, as they embody music festival season and the summertime. My favorite band tees are the ones I find at thrift stores, like this one. 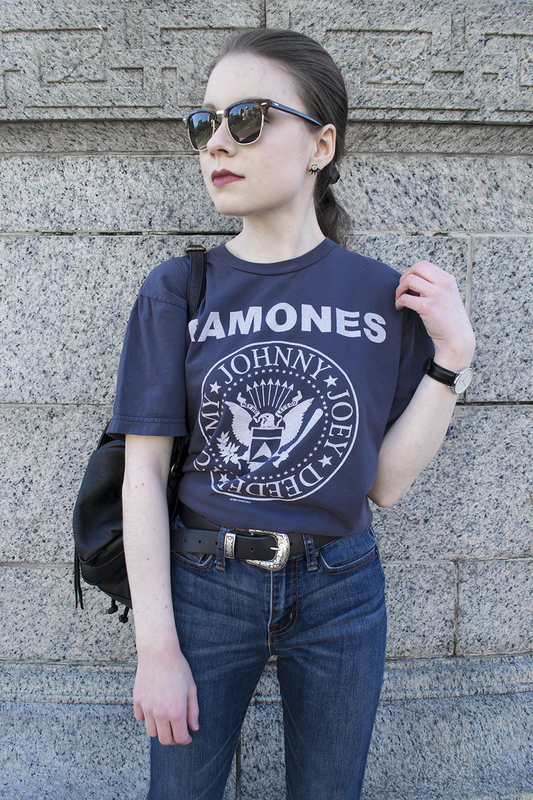 I had been wanting a Ramones T-shirt and loved the color and design. The soft, lived-in feel adds to the look. It's slouchy and oversized, which is how I like them. I styled my band tee with my favorite bomber jacket, a pair of thrifted mom-ish jeans (not really a mom jean, but very close), western belt, faux leather backpack, and Stan Smiths. To give the T-shirt a more fitted look, I tied it up in the back. Sunglasses and a watch complete the outfit. I'm with the band.